“Fall asleep with a dream and wake up with a purpose,” is the motto of general manager of East Coast Radio, Boni Mchunu. The inspirational message and life story that she shared at the networking meeting of the KwaZulu-Natal chapter of the Women’s Property Network (WPN) on Thursday 12th April was a perfect fit with the WPN mandate to create a forum for women in a predominantly male industry to exchange information, develop business contacts and enhance professional success. The Women’s Property Network meeting held on Thursday 12th April was sponsored by Evolve Furniture and Fitout and held at their offices at the N2 Business Park in Umhlanga New Town Centre. 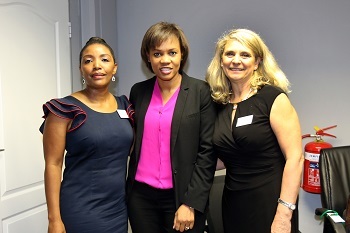 Pictured at the event are Queen Mjwara, KZN Chairperson of the Women’s Property Network with speaker Boni Mchunu East Coast Radio General Manager and Eileen Sammons of Evolve Furniture and Fitout. Evolve Furniture and Fitout donated a chair to Boni Mchunu for her office. It was sponsored by Evolve Furniture and Fitout and held at their offices at the N2 Business Park in Umhlanga New Town Centre. “WPN is dedicated to advancing the success of women in the commercial property industry. We were established in 2000 to act as a catalyst for change within the industry by providing our members and sponsors with opportunities to network and do business together. In many ways, the property sector is unique – but in many ways it is also very like the general corporate world with similar challenges. Even though she is in a different industry from ours, we are grateful to Boni for sharing her story of grit and determination. I am sure that many of our members were inspired to continue to work hard to develop their own careers after hearing her speak,” she said. Mchunu, who is in her second year as head of the province’s largest radio station, advised WPN members to define their own success. “Everyone is different. Be yourself, everyone (else) is taken. Successful people travel the road less travelled. The youngest of five girls, Mchunu was born in Imbali in Pietermaritzburg. She lost her mother when she was just two years old and her father whilst she was writing matric. She is also a strong believer that education is the key to success. This is shared with the WPN which offers a number of educational programmes promoting economic self-sufficiency as well as skills’ training development. This is achieved through ongoing workshops and programmes as well as the WPN Educational Trust which has awarded around 70 bursaries worth more than R800 000 to previously disadvantaged female students studying towards a property related degrees or diplomas. In addition to being a successful executive, Mchunu is also the proud mother of two sons and a daughter. Following Mchunu’s inspiring message, Mjwara asked various committee members to update KZN chapter members on important projects that were underway under the WPN banner. The UKZN Student Chapter – which was successfully launched on the 13 March 2018, to create opportunities for students through mentorship, leadership, networking support and courage development and growth. WPN is looking to partner with corporate sponsors to help fund speed mentoring events, where students can ask experts for advice as well as workshops to assist students with time management and help them to prepare for interviews. “The WPN is also working in collaboration with eThekwini Architectural & Urban Management Department and the KZN Department of Education and UKZN. We’re looking to launching a competition that will offer a prize for converting an existing commercial property into a school for the Inner-City Schools Demonstration project that was identified in the Inner City Local Area Plan and Regeneration Strategy (project Number 8 on the priority list). WPN is looking for corporate sponsors to ensure progression of the project,” Mjwara explained. She added that WPN was also keen to partner with a corporate sponsor/s for its Mandela Day event. This will raise funds to buy food to provide breakfasts for vulnerable school going children. The budget for this initiative is R30 000 and will provide 45 children with five meals a day for a year.